Norcia, Italy was shaken by another large earthquake today, magnitude 6.6. The monks of Norcia are safe, but the Basilica has been utterly destroyed. They ask for our prayers, not only for them but for the people of the area. While suffering alongside them, the monks are also trying to pray and minister to them. News footage shows drone views of Amatrice and Norcia. 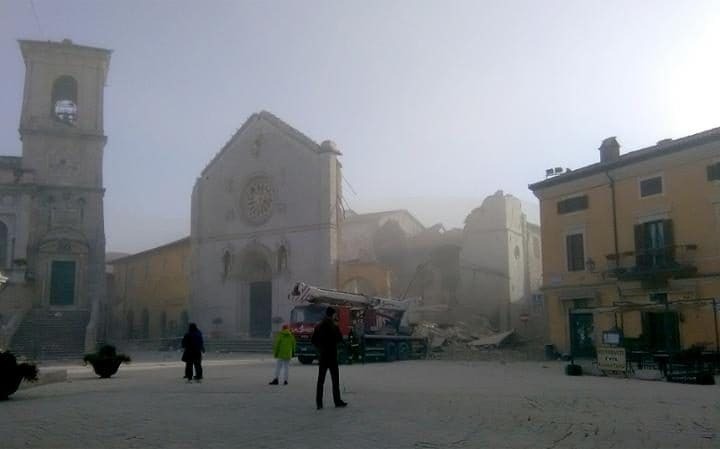 As the image below shows, the Cathedral and Basilica in Norcia have been destroyed. Norcia’s 14th-century Basilica of Saint Benedict, built on the reputed birthplace of the Catholic saint, was reduced to rubble. The church is looked after by an international community of Benedictine monks based in a local monastery which attracts some 50,000 pilgrims every year. “It was like a bomb went off,” the town’s deputy mayor, Pierluigi Altavilla told Rai News 24. Damage was also reported at St. Paul Outside the Walls in Rome, one of the four cathedrals of the Holy See. It is also home to and maintained by a community of Benedictines. After a careful study of the developing seismic situation in our region of Italy, as a precautionary measure, we have decided to temporarily transfer our community to Rome. The monks of the international Benedictine headquarters at St. Anselmo in Rome have kindly offered our monks a place to remain during this period of uncertainty. We would be grateful if you added the monks of St. Anselmo to your prayers for their generosity during our time of need. While the community is in Rome, two monks will remain in Norcia to keep watch over the basilica and monitor the developing situation. They will avoid danger by sleeping in tents outside the city walls. We strive to maintain the order of the Rule even during the most difficult of circumstances, and this transfer, while disruptive, will ensure the safety of our monks and grant us all the peace to continue to practice our monastic life. Please continue to pray for our community, and consider giving a gift to help our effort to rebuild. Benedictine Sisters around the world are holding these monks, and all the people in central Italy, in prayer.